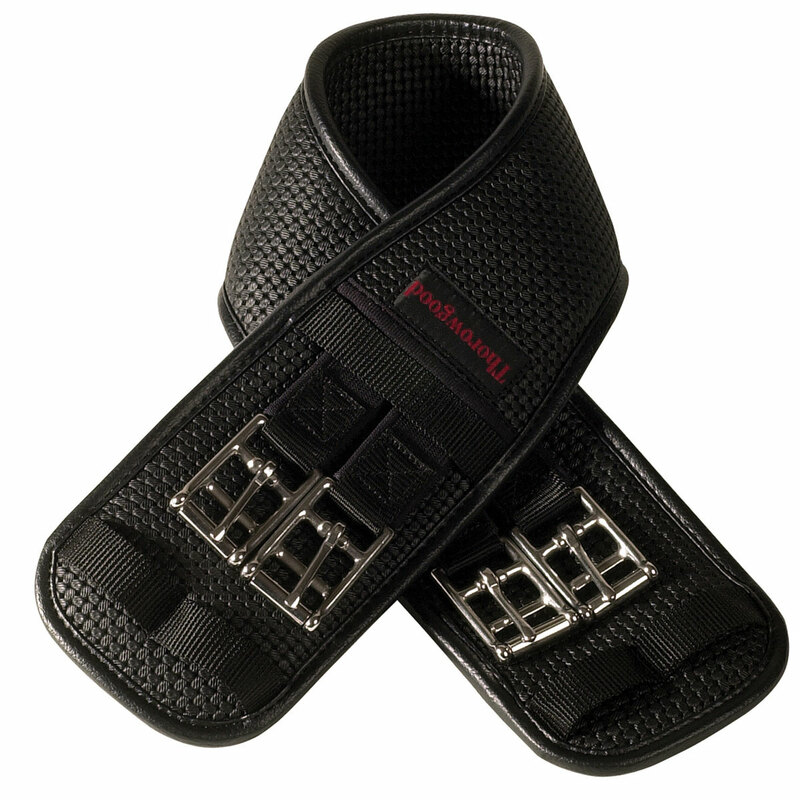 The award-winning Thorowgood Dressage Girth features stay-soft Airoform cushioning throughout. The material is textured for optimal airflow and comfort for your horse. Shaped to fit and eliminate pinching. Designed with double layer stitching system and stainless steel roller buckles on both ends for superior strength. Thorowgood Dressage Girth is rated 4.6 out of 5 by 11. Rated 5 out of 5 by Nao4 from Good value. Nice girth for the price. Soft material. I bought this to replace my old one that I used for several years and developed a crack. They last a long time and are easy to clean. My horse is comfortable in it. Rated 5 out of 5 by bziegler from So comfortable for my horse My horse has rubs from his old girth, and this girth hasn't bothered him at all! It's all so easy to roll up onto the billets. Rated 5 out of 5 by Virginia from Great girth. It has elastic on both ends for the horses comfort. It grips the horses belly, especially on my ponies. Also easy care and great price. Rated 5 out of 5 by bias123 from My mare has no complaints! Very happy! Bought this about 6 months ago along with a more expensive brand. This is the one that I use all the time! My mare is very round and does eventing...fits her great! No rubs from buckles or edges too. Rated 4 out of 5 by Lidari from Just what I needed Fits so well for my POA and the long billeted treeless saddle I use on him. He is a little girthy and not so much with this one, it is so cushy. Rated 5 out of 5 by lima bean from comfortable girth with good price My horse does not get chaffed by this girth, period. She is easily chaffed (under 30 minutes ride time) by leather ones, especially the ones that are thinner behind the elbows. This is the third one I've purchased as the girth eventually splits on the edges after 3-5 years of regular use. I don't exactly care for the girth as you are supposed to so maybe would last longer if I did. I wipe it after each ride but that's about it. It's a great product as far as price, function, and durability. Rated 4 out of 5 by karenw from Good girth for the price Bought this to use with my surcingle. It is a good girth for the price. Rated 5 out of 5 by Erinkl from Great product and price point I have used Thorowgood girths for years. They are great for easy cleaning and even the girthiest horses will have no issue due to the elastic buckles. The nice wide design helps to distribute pressure. Rated 3 out of 5 by Jamie from smartpak one is nicer, lacked keepers I bought the smart pak one originally but needed one size smaller (which they did not make) so I tried this one instead. It didn't have keepers and despite the length being shorter (at least the buckle to buckle distance) the girth still bumped into my saddle pad which was the problem I was trying to fix. It also didn't have nice keepers like the smart pak one. I ended up returning it.